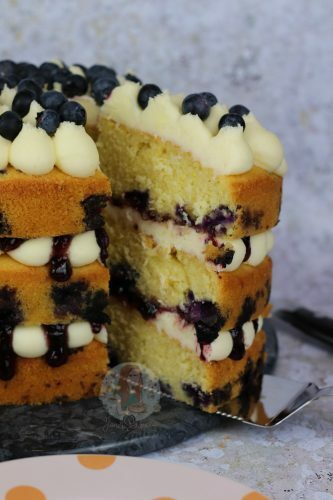 A Three-Layer Fresh Lemon & Blueberry Cake with Lemon Sponges, Fresh Blueberries, Lemon Buttercream, and Blueberry Jam! As its the new year, I wanted to do some cracking new recipes, and some fresh delicious recipes. Honestly, I don’t think I have ever been prouder of a cake because DAMN this one worked well. Like so well I refused to share the first go, and part of the second, and a little of the third…. I didn’t need to make the cake several times, but I did because I LOVED it so much. I didn’t think Blueberries would be any good at this time of year yet, but oh my they have been seriously delicious. So, this cake happened. I was wondering how I could make something fruity, and light, but so moreish and a bit of a showstopper… so I wanted something that would dazzle. 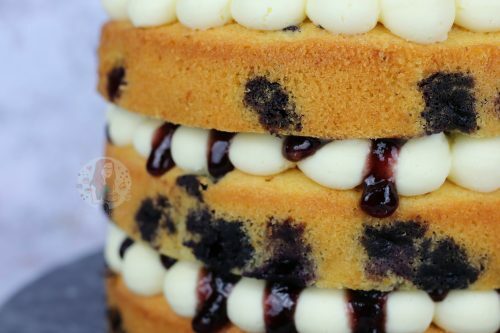 The fresh blueberries in the sponges give the cake a hole new element. 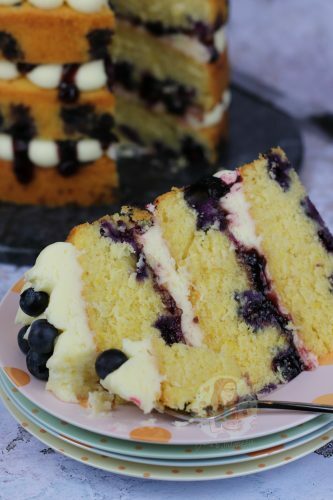 I based it very similarly on my Biscoff Cake, but used caster sugar instead of light brown sugar as I wanted a lighter sponge in flavour, and something that would help the blueberries along. I didn’t just want to make it blueberry however, and the best fresh flavour to match it is of course, Lemon. Helloooooo one of the best combinations ever. Ever. I went for a three layer cake because I just think they look insane, but there are notes below on how to make it only a two layer if you wanted. However, you will definitely want three layers. 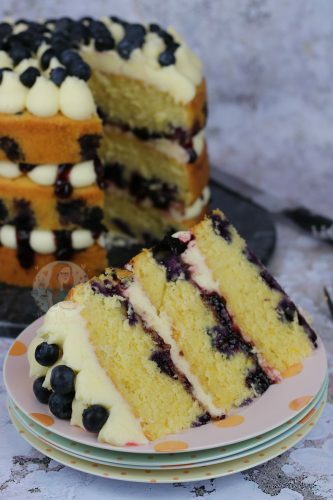 Thing is, to give it a bit of whammy, I added in two lemons worth of zest, along with the fresh blueberries, and to be honest you could eat the sponges just like that. However, I wanted more. There comes the blueberry jam, and lemon buttercream frosting. I always think using fresh Lemon Zest and then Lemon Juice in recipes is the best and truest way, but obviously sometimes using lemon extract is just easier. However, when you had an awful cold, and your mum supplied you with ~endless~ lemons for hot lemon water, you have to use them up somehow. And cake is simply the best way! 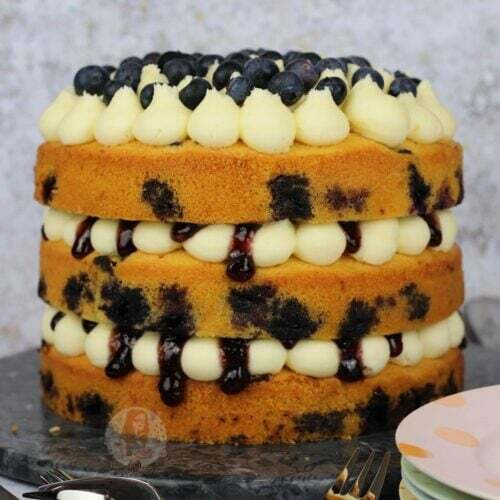 Blueberries are also healthy, so like.. its a healthy cake?! To be honest, cake is cake, but if you need to make yourself feel better, fruity cakes are ideal. Sometimes I do think that all I want is a chocolate cake, but other times I craving something not to filling, but fresh, like this! Yes, it still has buttercream in it which some people can find too much, but I purposely don’t overfill mine. I realise sometimes people can make my recipes and have buttercream leftover, but everyones piping tips are different, and piping techniques, but for this I had the exact amount. Heat the oven to 180C/160C Fan and line three 20cm/8inch sandwich cake tins with baking parchment – leave to the side. In a stand mixer, beat together the butter and caster sugar for a few minutes until light and fluffy. Add in the flour, eggs, and lemon zest and beat again briefly till combined – try not to overbeat! Carefully fold through the 300g of fresh blueberries into the mixture. Divide the mixture between the three tins and smooth it over – bake for 25-30minutes until the cakes are golden and when the cake springs back (skewer should also come out clean)! Once baked, leave the cakes to cool in their tins for 10 minutes or so, and then remove and leave to cool fully on a wire rack. If the cake has domed slightly, leave the cake to cool upside down to flatten it slightly so its easier to decorate later! Beat the butter with an electric mixer for a couple of minutes to loosen it – Gradually add the icing sugar on a slow speed until it is combined, add the lemon juice, then speed the mixer up and mix for 3-4 minutes until thoroughly combined and smooth. If its too thick, gradually add the boiling water until you reach the desired texture – I usually add 2 tablespoons! Keep on beating for 2-3 minutes until whipped and silky smooth! Using your favourite piping tip, I used a large round tip, pipe the buttercream onto the bottom layer of the cake. Add some jam, I drizzle it slightly to make it look pretty, and add the second layer, and pipe buttercream on again, and then the jam again, and add the final cake layer. 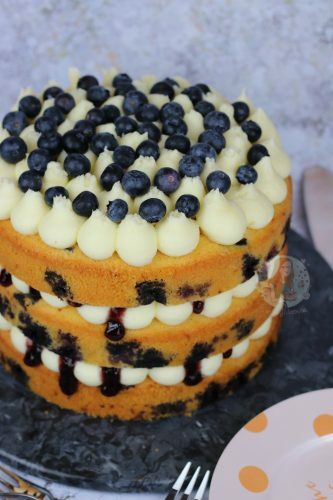 I then pipe the rest of my buttercream on top, and add on some extra fresh blueberries! This cake will last at room temperature for 3 days. I used a a large round tip to decorate my cake, but you can use any really! I used Blueberry Jam because I wanted an extra Blueberry hint, but this is optional. Also, you can use lemon extract in the sponge and buttercream if you wanted instead of the fresh lemon zest and juice. The cake may take a little longer to bake due to the moisture coming from the blueberries, but don't worry, just wait till a skewer is clean and it's not making a bubbling sound anymore. You can try frozen blueberries, but be warned they may create even more extra moisture. I love this style of cake as you can tell from the few I have made, and I happen to have 3 8″ tins, if you don’t have 3 tins you can make a smaller version of the cake, use 300g of everything in the cake mixture rather than 400g, 6 medium eggs (and it might take an extra 5-10 minutes to bake) and use 2/3 of the decoration recipes! Find my other Cake Recipes on my Recipes Page! Older Next post: Kinder Bueno Rocky Road! Newer Previous post: No-Bake Toblerone Tart! Hi, would I be able to make this in 3 7″ cake tins instead of 8″ ones using the same quantities of ingredients? You could, but it will take longer to bake and be very tall! Hi Jane! I hope you’re well. Is it OK to freeze these cakes for a few days before assembling them? It can affect the fruit sometimes, but if you don’t mind that then go for it! Thank you, lovely! I have made this cake once before and it tasted amaaaaaazing! Thank you for the wonderful recipe. I wanted to make it as a celebration cake for a cousin that’s just had twins, so I was wondering whether making it before this weekend and freezing would be a good idea! Do you think I’ll be better off sticking to a good old vanilla sponge? Hi! Would this recipe work ok as cupcakes?? Giving it a whirl this afternoon! Thanks! Yes I’m sure it would! I have a lemon & blueberry muffin recipe that’s already suited for 12 cupcake sizes – but this cake you will probably get 30 cupcakes or so! I’ve made this cake twice now and both times it’s gone down a treat! Very easy and looks amazing. I absolutely love this recipe. 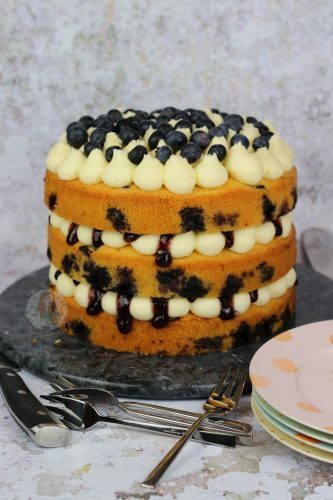 Just one question how do I stop the blueberries sinking to the bottom of the cake? I’ve tried flouring the blueberries but still sink. Do you think sprinkling them on top of the mix just before adding to the oven? Hey! yes sprinkling them over would be best! Also, try not to over mix your cake batter so its nice and thick and that should help as well! This cake looks amazing! I want to make it for my boyfriend’s birthday this week but he lives in Germany and I am struggling to find self raising flour here. Do you know how much flour and baking powder I should use to replace the self-raising flour if I am making the 2 layer version? I’ve just made this cake for my best friend’s birthday tomorrow and it looks amazing! Can’t wait to have a slice! Just one dilemma- it’s quite tall and I don’t have anything to transport/ store it in. What boxes/containers do you use for taller cakes? Hi Quick question – can you freeze the sponge and then fill and decorate once defrosted or is that risky given the high moisture content? Instead of using lemon zest (on cake) and lemon juice (on buttercream) how much of the lemon extract shall I use? Made this last weekend and everyone absolutely loved it! I cant see the recipe for the 2 layer cake? Where can i find it please? It’s in the notes section. This recipe won me first place in a work bake off! Thanks so much! Cake looks great! Would like to make this cake and cover it in fondant for a communion cake . If I was to leave out the 300g of blueberries would the cake recipe need to be adjusted? I’m thinking of using this recipe for my wedding cake. Once covered in fondant, how long would the sponges last? What brand of Blueberry Jam do you recommend? Any really, but I used Hartleys as I had some already!